Stream-based nodes vs. equipment-based nodes. More effective node definition streamlines the guideword-deviation conversations and decreases tendency to tunnel-vision. Stream-based nodes allow for discussion of operating procedures and even for simultaneously conducting a Procedure HAZOP. More effective ordering and application of guidewords avoids duplication of effort, saving time and minimizing tedium. More effective closeout of action items. More extensive and focused pre-work saves time in HAZOP sessions. The typical HAZOP defines nodes based on equipment items; often one equipment item per node. 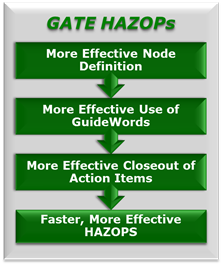 The GATE HAZOP Process features stream-based nodes. A stream is followed from its inception to its logical conclusion. This is especially useful when considering FLOW deviations, because a FLOW disruption in any part of the stream affects all parts of the stream. These stream based nodes are much larger than typical equipment-based nodes and hence overcome the tendency of HAZOPs to create tunnel vision. TEMPERATURE deviation discussions focus on the heat sources and sinks. A temperature change anywhere on the stream-based node potentially affects all equipment downstream of that point. For PRESSURE deviation discussions the node is divided at spec breaks. LEVEL deviations discussions focus on individual equipment items. HAZOPs typically consider FLOW, PRESSURE, TEMPERATURE and LEVEL guidewords, but most pressure, temperature and level deviations are caused by flow deviations. Considering all four guidewords results in duplicated effort and tedium. The GATE HAZOP uses FLOW deviations to educate the team about the behavior of the node. Most consequences are captured during the subsequent PRESSURE, TEMPERATURE and LEVEL deviation discussions. The only consequences captured during the FLOW discussion are those directly caused by flow, i.e. erosion, vibration, noise, etc. FLOW disturbances propagate through the process, often in non-intuitive ways. It is instructive to mentally simulate the behavior of the entire node and perhaps other process systems outside the node. HAZOPs are supposed to evaluate operability, but that can’t be done effectively without reviewing the operating procedures. But there is no point in a typical HAZOP at which the procedures can be effectively introduced. Stream-based nodes provide a natural bridge to the procedures. High level operating procedures can be, and should be, introduced during the stream-based node discussion. A Procedure HAZOP often provides more insight than the Process HAZOP. HAZOPs typically evaluate how a system should respond to a problematic event. We are also interested in how the control room operator should respond. Operator response is dependent on information. Questions such as “Does the control system give the control room operator adequate information to identify and respond to a problem?” and “How will the control room operator know this is happening?” need to be explicitly asked. A HAZOP culture has developed in which we are supposed to identify the problems, but not solve them. But engineers want to solve problems. Stopping the discussion abruptly at the problem identification is unnatural, unsatisfying and results too often in ambiguous recommendations to “study” a problem. The HAZOP team contains subject matter experts who are rarely gathered together. It makes good sense to spend a bit of time solving the problem. We suggest a middle ground. Where recommendations are made the team should identify possible solutions and perhaps debate the merits of one or more. Obviously the discussion has to be limited by the facilitator to keep the HAZOP on schedule. Hazard rating is challenging in HAZOPs. GATE recommends rating the hazards and protections per the SIL approach (IEC 61508). SIL rating can be easily and quickly applied during the HAZOP via a simplified SIL Targeting method. This approach makes risk judgment easier and simplifies judgments regarding the adequacy of closeout actions. Effective and extensive pre-work can significantly decrease the HAZOP session time. The HAZOP isn’t finished until the action items are closed out. Many forces conspire against effective closeout of action items, and so a structured approach should be applied to improve the closeout process.